One morning as I glanced at the clouds from the kitchen window, I noticed with delight that the bougainvillea I assumed was dead had blossomed again. Grasshoppers unknowingly imported from a hibiscus I purchased had swarmed over my lovely plant and ate the foliage. It was in an awkward spot to spray with bug killer or to pick off the insects one by one. And with my allergies, I was reluctant to use pesticides, so I gave up and stopped watering what remained of the once vibrant flowering shrub—only bare branches. But a downpour of rain from recent storms soaked it, and it pushed out new growth again after many months of lying dormant. I had missed the cheerful blossoms and was so glad they had returned. There beyond my kitchen window was a lesson just for me and maybe you too. 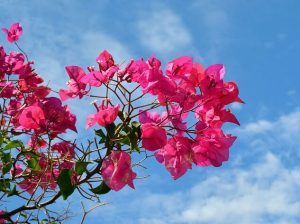 Sometimes I feel like that bougainvillea whenever I focus on my circumstances instead of on the Lord. When I rush ahead of Him and do things on my own, grasshoppers of discouragement, worry, and fear invade my life. I too dry up after opening the door to these enemies. When God points out I’ve let peace-devourers inside me, I turn back to Jesus and ask Him to forgive and restore me to close fellowship. Then I can once again please Him and enjoy the life-giving water of His Spirit and Word. Has your life ever seemed as though it was about to dry up? God’s living water can revive you—no matter where you are in life or what you’ve done. Turn to Him with repentance and ask Him to give you the gift of eternal life through Christ or restore the joy of His salvation. Dear Lord, please help me keep my eyes on You instead of on my circumstances. Go Deeper — Keep looking to Jesus instead of your troubles. ← Here’s How to Have A Successful Blog.